» North Face Venture Jacket Review – A Good Versatile Outdoor Jacket? North Face Venture Jacket Review – A Good Versatile Outdoor Jacket? More often than not it’s the simple, dependable clothing items that become the favorite. The Breathable North Face’s Venture Jacket is one such piece of outerwear that is reliable, versatile and sure to be the first one you grab when you’re expecting rain or wet weather with your favorite rain pants and water resistant boots to keep you dry. On the outside, the fabric of this jacket may seem fairly bland compared to the fabric of others available from TNF but it remains a true workhorse for any hiker on rainy days. The North Face produces a wide range of different waterproof breathable outdoor gear that is great during rain season for hiking or backpacking, but the company is perhaps more famous for their apparel. Their jackets and sweaters are popular for their attractive, flattering cuts, overall durability, and performance in harsh conditions. 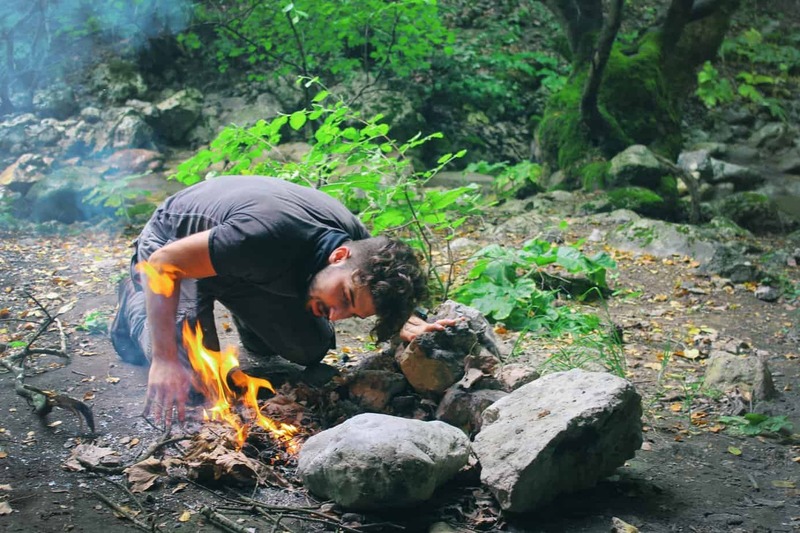 Loyal fans find that The North Face is one of the few brands that produce fashionable outdoor gear that can actually live up to its claims of hiking. A basic water resistant rain jacket or rain shell is a must for anyone who wants to hiking rain and stay dry, whether they just enjoy taking jaunts around the neighborhood year round or are a serious backpacker, hikers climber, etc. The Venture Jacket waterproof protection is the perfect jacket for your daily gear to use across a range of different outdoor activities and sports. See below more about this North Face Venture Review! Although the Venture Jacket was created to be a simple layering piece or standalone rain jacket, the features it does have really makes it stand out from competing outerwear. The outer shell is breathable but waterproof, allowing comfortable use almost all year round, and not only for rain wheater. Sealed seams drastically reduce the chance of leaking in heavy rain or other wet weather. These features all contribute to how tough, breathable, versatile and comfortable the Venture Jacket is. When you spend money on a water repellent rain jacket the last thing you want to happen is to tear, lose stitches or lose its waterproofing capabilities. 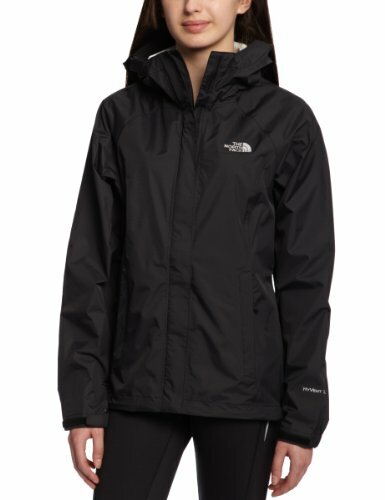 Even though the Venture Jacket is a fairly budget-friendly item compared to the majority of The North Face’s jackets, its lower price does not mean this waterproof jacket its inferior quality. Overall the Venture Jacket fabric is very durable due to its construction and materials. If you are already familiar with TNF’s apparel, you already know that they make their products to last a lot of hiking travels. And this model will definitely keep you dry and protected from water. 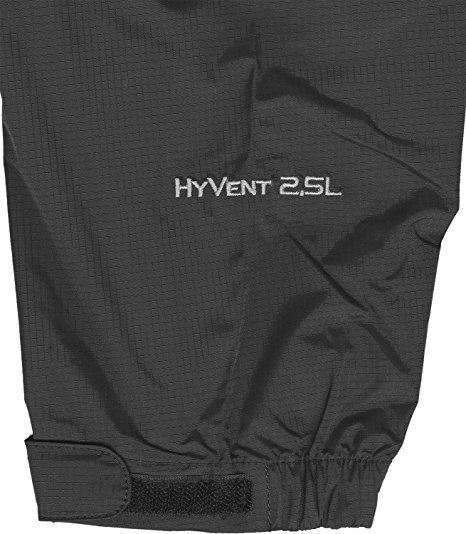 This HyVent membrane is applied to the outside of the 40D shell which gives the Venture Jacket it’s highly waterproof nature. While the outer layer is all about keeping water out and protecting the jacket from regular wear/abrasions/scratches, the waterproof breathable fabric in its inner layer has a PU coating which allows ventilation so the water vapor (think sweat and general humidity from your body) to get out of the jacket. This inner layer is what makes the jacket breathable and waterproof from the inside. Since The North Face used HyVent technology, they do stand by the claim that this jacket isn’t just a rain coat but also is ideal for use for backpacking in snowy conditions and sports/hobbies like skiing. Its excellent shell durability means normal wear and tear from brush isn’t an issue at all and the waterproof jacket can perform very well for climbers that need something that won’t give out from stress from rocks, ropes and generally harsher terrain. HyVent’s waterproofing and breathability also give the Venture Jacket an additional benefit- it provides excellent wind protection. Since the jacket is created to repel moisture away from the body, the windproof fabric naturally prevents wind from piercing through the jacket and reaching the skin which makes it perfect for hiking during difficult weather. The adjustable drawstring features of the hood and hem, as well as the Velcro cuff tabs, can be cinched down to stop the wind from entering. Even the storm flap over the center zipper helps keep wind out. Remember, if you plan to use this jacket in conditions you will need to layer to stay warm as the Venture Jacket is purely a waterproof rain shell. The same tip goes for use in cold weather with harsh winds. The Venture Rain Jacket is comfortable to wear and doesn’t feel stiff or too bulky like many rain jackets with waterproof protection may. 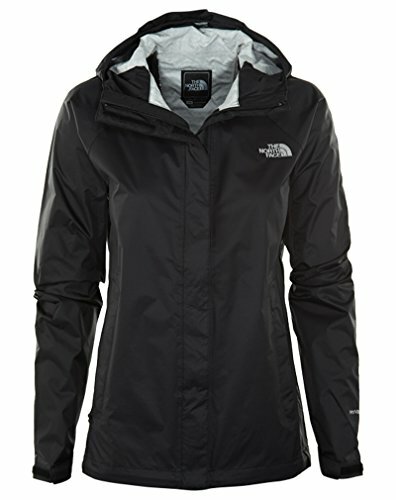 The 40D nylon and HyVent coating make this jacket soft and allows easy layering under it. Overall the jacket is super lightweight, the men’s weighing roughly 14.11 ounces and the women’s weighing 11.99 ounces. Due to its weight (plus it’s compressibility for storage) it is especially suitable for ultralight or light backpackers and even cyclists that just need something to keep the rain off them. Since the jacket is so breathable, it wicks away sweat which keeps you dry but also helps keep your core temperature steady which is particularly important in cold weather. Many people make the mistake of thinking breathability is only important in hot weather but actually, in cold weather you can quickly get chills and quite sick if sweat is trapped or if cold air hits any damp clothing against the skin, so make sure the jacket you choose is waterproof and breathable enough. According to The North Face, the Venture Jacket is “regular” fit, however, neither the men’s nor women’s is boxy or cumbersome to wear. The Venture line, like so many of TNFs jackets, is fitted with average gender anatomy in mind. This means the men’s has fairly straight lines but the women’s has a slight hourglass shape typical of the average woman’s body shape. Overall the Venture Jacket is very clean looking and despite being fairly basic in appearance, you can find them in a huge range of colors- 42 total in everything from basic black or white to bright and bold colors such as “Dramatic Plum” or “Power Green”. Some jackets are one color while other options have multiple tones. 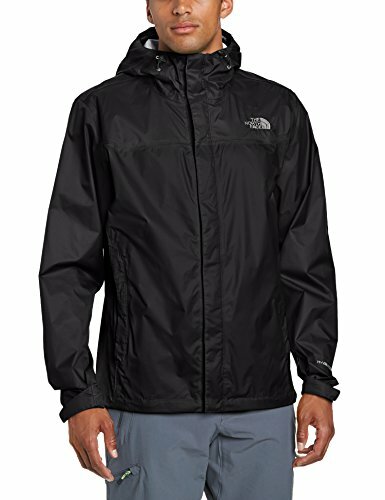 The North Face’s Venture Jacket is a very useful piece to have in your closet. It is popular jacket with fairly consistent positive reviews. There seems to be a trend that a commonly cited issue with the jacket is its lack of warmth. As mentioned earlier, keep in mind that this jacket was created as a rain shell and not a standalone jacket for cold weather. You will need to use layers in cold weather as this jacket’s job to waterproofing, not warmth. With this in mind, this jacket is an excellent choice for everything from outdoor sports to running errands in wet weather.